Editors note: This article is part of a five-part package dealing with operating costs in 2017. 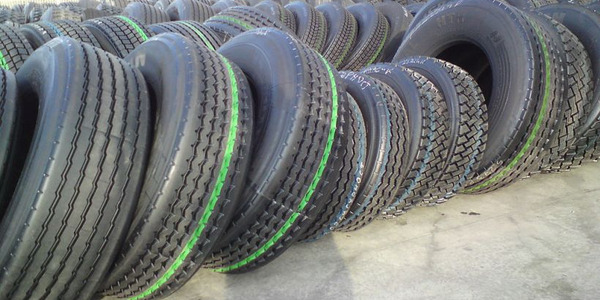 Read related articles that offer and in depth look at tire prices, fuel spend, and fleet maintenance, as well as an overview of operating costs in 2017. 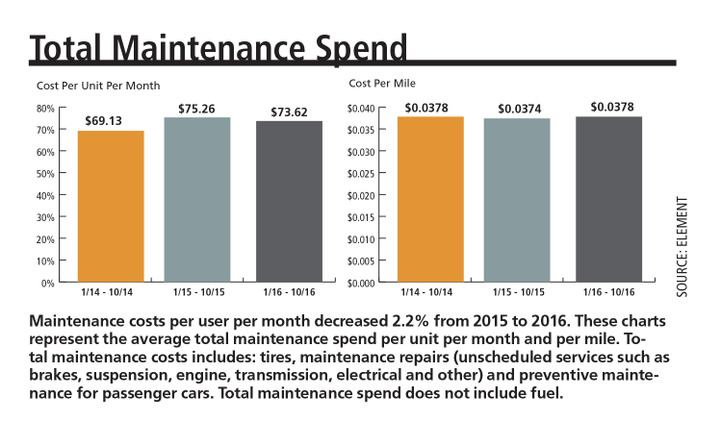 Preventive maintenance (PM) expenses in calendar-year 2017 were flat compared to 2016, primarily due to improvements in engine design, onboard vehicle technology, and improved oil quality, which is allowing fleets to extend oil drain intervals. PM cost are flat due to improvements in engine design and vehicle technology, along with improved oil quality, allowing extended drain intervals. More OEMs are recommending more stringent motor oil requirements, such as the use of synthetic motor oils, which is increasing the cost of each PM service. Some vehicles now have larger oil capacities, which increased PM costs. The forecast is for PM costs to remain flat in 2018. “In general, we have not observed any differences concerning the impact of motor oil costs on fleets,” said John Wuich, vice president, business analytics at Donlen. 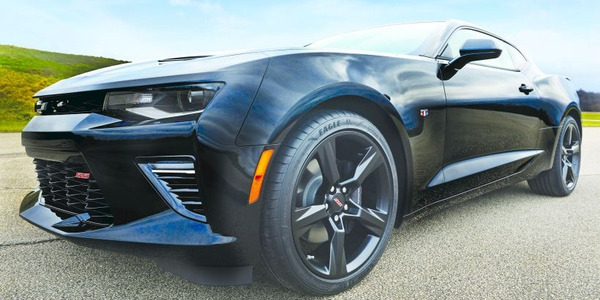 More automotive manufacturers are recommending more stringent motor oil requirements, such as the use of more expensive synthetic motor oils, which is increasing the cost of each preventive maintenance service. But, the higher quality motor oil also allows the intervals between these services to lengthen, which is offsetting some of the additional per-transaction costs. Also, contributing to the industry-wide trend of extended oil drain intervals is onboard oil life monitoring systems that are installed as standard equipment in some popular fleet models. As mentioned, the longer drain intervals are offsetting the higher per-transaction price, making PM costs, on average, flat for CY-2017 when compared to CY-2016. “Overall, oil costs have dropped slightly in the past year. This is mainly attributable to the continued stability in the cost of oil and the increased requirement of synthetic oils in more vehicle applications,” said Christopher Foster, manager, truck account administrator for ARI. While there are regional differences in prices, when averaged out on a national basis, PM costs have been relatively stable. “Oil prices have been a bit jumpy this year, but overall have remained fairly flat, only experiencing a slight increase,” said Mark Donahue, manager, fleet analytics for EMKAY. While oil drain intervals have decreased, the proliferation of smaller displacement engines in fleet applications is putting pressure on OEMs and fleet managers to use synthetic oil, which provides 50% better engine protection, to maximize engine life. Most manufacturers have extended oil change intervals and switched to synthetic oils a few years ago. “While the overall CPM has remained fairly flat, fleets are consuming more, driving the spend per month up, especially over vehicles operating more than 24,000 miles,” said George Albright, assistant director of maintenance for Merchants Fleet Management. In addition, onboard oil monitoring system of some models, which reflects actual driving patterns, often allows for longer oil change intervals. 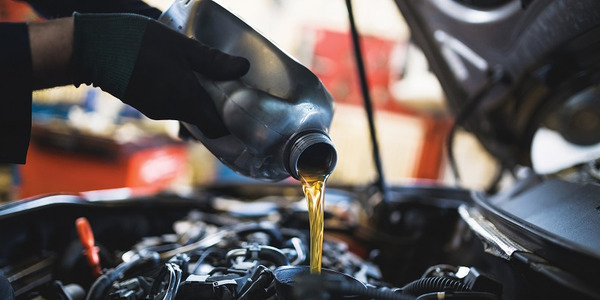 “We have seen more and more manufacturers require the use of synthetic and synthetic blended oil, which can drive up the overall cost of preventive maintenance services. In many cases, however, this is offset by the extended drain intervals,” said Mark Ackerman, director of maintenance & repair management for LeasePlan USA. 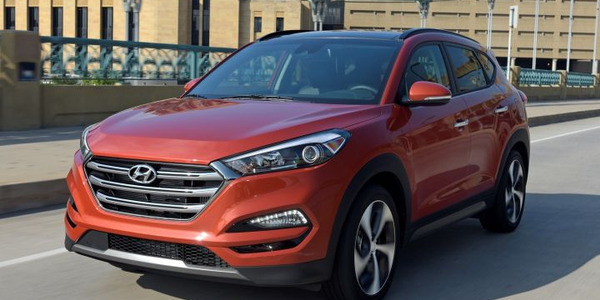 Total oil costs have increased slightly, year-over-year, as more vehicles are utilizing synthetic oils. The increased cost is being balanced out by the decreased frequency of services, resulting in less downtime for oil services. 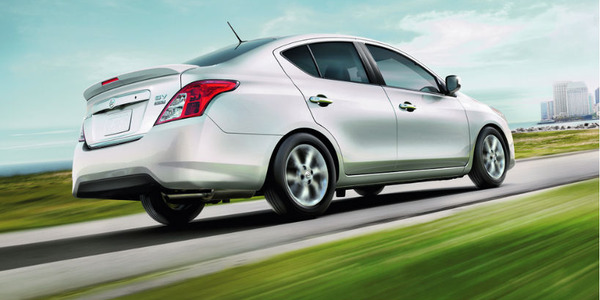 “The fact that synthetic oils are higher in cost than mineral-based oils remains true. In order for a fleet to benefit from the improved oils, they must further extend drain intervals in order to maintain or reduce PM expense. However, this must be a careful decision as vehicles still need periodic inspection in order to optimize performance, fuel economy and overall cost of ownership,” said Foster of ARI. The policies of some OEMs for more stringent motor oil requirements have put upward pressure on PM costs. “Donlen has noted a continued shift from use of regular oil to semi-synthetic and synthetic blends. With this shift also comes decreased oil change intervals. 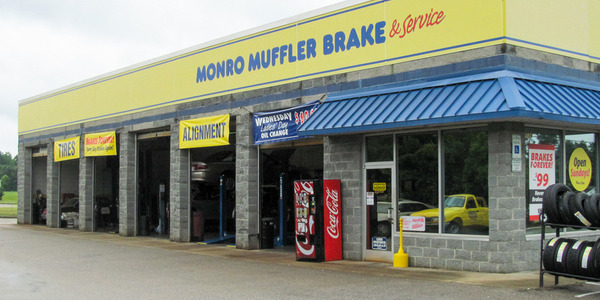 This means that increased oil change prices are offset by fewer scheduled maintenance visits,” said Wuich of Donlen. The cost of the specific motor oil often offsets the savings of extended service intervals, increasing the importance of regular oil level checks. “One of the greatest influences in this category is the trend by manufacturers to move toward lighter weight oils (0W16, 0W20, etc.) in an effort to improve fuel economy. These oils are more expensive in the marketplace, therefore driving up the average cost of oil changes; however, improvements in oil quality have resulted in an industry trend toward extended drain intervals. 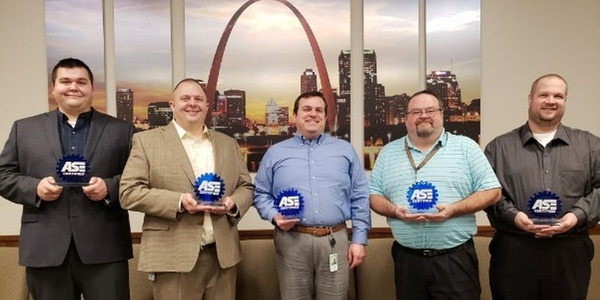 Greater time and mileage between oil changes translates into reduced driver downtime and shop visits,” said Mike Emmons, national service department manager for Enterprise Fleet Management. Conventional motor oil usage has diminished in favor of synthetic oils, which have become required by some OEMs. “Each year more OEMs make synthetic oil a requirement in their vehicles. Greater availability of synthetic oils coupled with the longer associated service intervals should help stabilize and bring down costs slightly,” said Donahue of EMKAY. 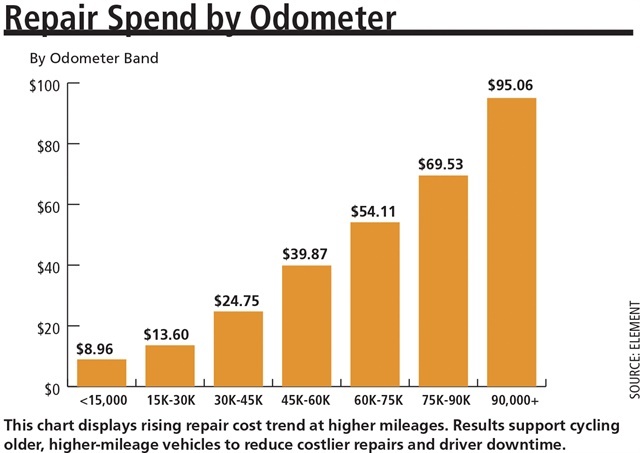 One factor helping to stabilize costs is that the price of some motor oils have declined. “Historically specialized oil specifications such as DEXOS were not available or were at a premium price. The availability of these oils has improved and costs are reasonable,” said Chad Christensen, senior strategic consultant for Element Fleet Management. Truck fleets have also seen the introduction of new motor oils. “This past year saw the introduction of two new oils developed by the American Petroleum Institute (API) designed to help address high temperature issues tied to newer diesel engines (from 2007 and going forward) and those with SCR equipment installed. They were also a response to calls for longer drain intervals, better fuel economy, lower emissions, and increasing horsepower. The new oils are ‘backward-compatible,’ meaning they were designed to work with oils that are currently on the market. The impact — both in terms of direct oil costs and the possible benefit of improving fuel economy — of the new oils has yet to be determined because adoption of the new technology continues, but I expect to see more reporting on how this is impacting fleets in 2018,” said Foster of ARI. One additional factor is that with some models oil capacity has increased necessitating the use of more quarts of oil than what was used in the past. Emmons of Enterprise Fleet Management also cited this trend. “Engine oil capacities among new model vehicles have trended upward, increasing the average prices of oil changes,” said Emmons. Not only are more quarts used, but the “additional” quart comes at a higher price. 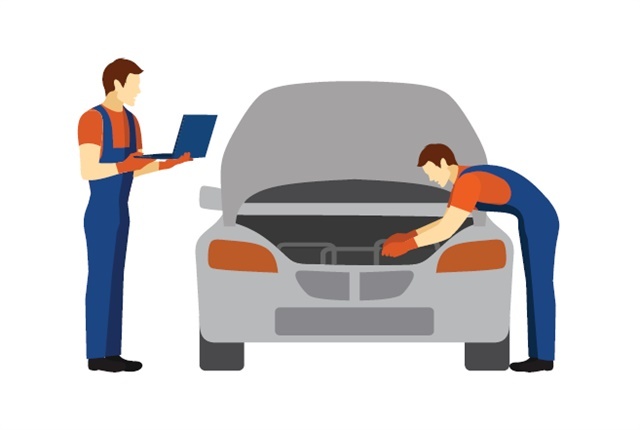 “Many vehicles use more than five quarts of oil so most advertised oil change prices that only include five quarts may not apply. Additional quarts of oil are costing more than one would expect,” said Mark Lange, CAFM, managed maintenance consultant for Element Fleet Management. “As an example, if a five-quart oil change price is $30 and the vehicle uses seven quarts of oil, the two additional quarts of oil needed may be charged out at $6-$8 per quart so now the oil change is $42-$46.” Another factor adding to the cost of draining oil is new oil filters. “Cartridge oil filters have become more common and may cost more than the typical spin-on filter,” said Lange. 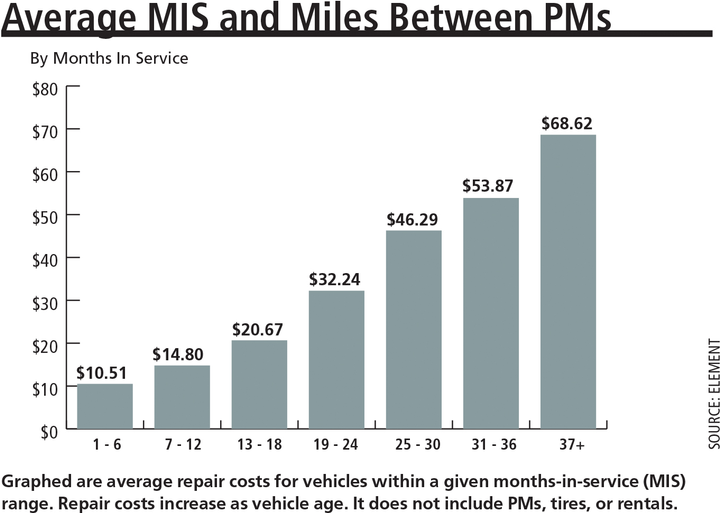 As fleets hold vehicles in service longer, it has an impact on PM costs. “Older vehicles are remaining in service longer due to extended total cost of ownership timing for maximum turn-in value has an impact on maintenance costs,” said Albright of Merchants Fleet Management. Likewise, the increased use of hybrids influences PM costs. “Hybrid and alternative fuel solution development from a marketing perspective has decreased due to a lesser demand for alternative solutions,” said Albright. One question is whether to have the oil changed at a quick lube center or a service center. “Clients are having to balance cost savings and time savings. 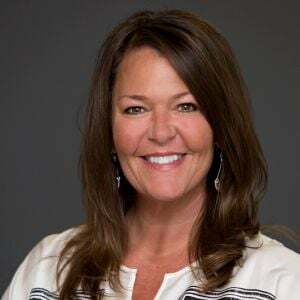 For instance, quick lube facilities continue to charge a higher cost for oil changes than service centers, which offer a broader array of services,” said Christensen of Element. Most subject-matter experts anticipate that PM costs will continue to remain flat in 2018. Continued stability related to the cost of oil, along with increasing drain intervals, and the continued acceptance of synthetics will help keep PM costs stable. "We expect pricing to remain stable heading into 2018. Stability related to the cost of oil, along with increasing drain intervals and the continued transition to synthetics across more vehicle applications should have a favorable impact on overall preventive maintenance costs,” said Foster of ARI. 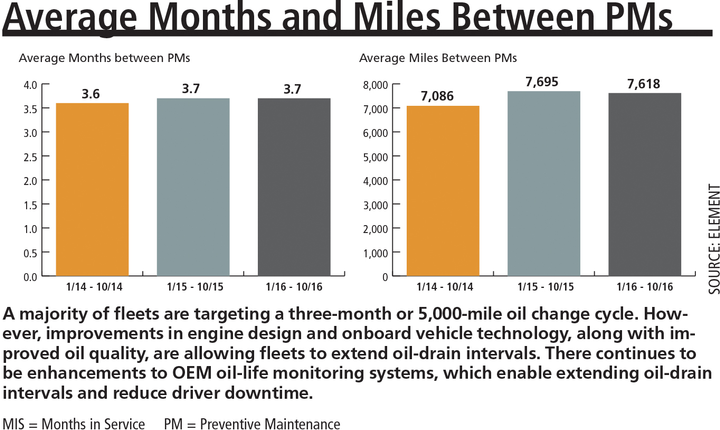 On average, oil drain intervals are lengthening and will continue to do so as older fleet models are retired from fleet service. 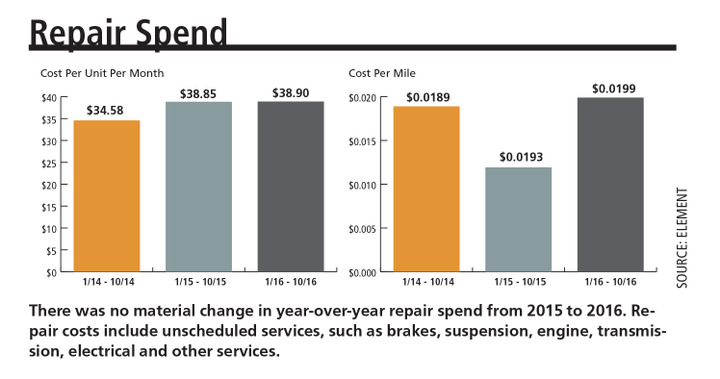 “The cost of oil changes has stabilized and we see little difference in cost from last year. However, a few auto manufacturers have introduced a new oil filter cartridge that is not readily available at many national accounts and has a higher replacement cost. 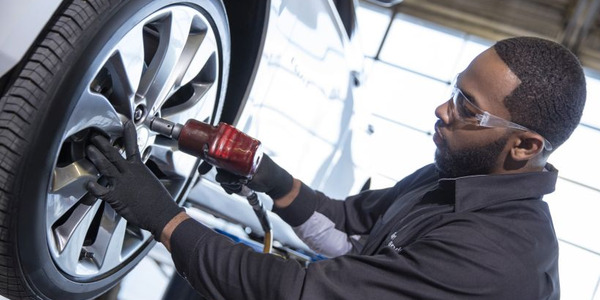 This can contribute to higher oil change costs on some models,” said Jeff Whiteside, assistant vice president, manufacturer relations and repair services at Wheels, Inc.
One concern on the horizon is the potential impact of higher labor rates and whether these increased overhead costs will be passed on to fleet customers. The economy is strong in many regions and there is market pressure on employers to offer salaries that would be competitive in a tight labor market. “In the long-term, the forecasts show moderate price increases generally following the price of crude oil,” said Emmons of Enterprise Fleet Management.